Wednesday, December 20 is the first early National Signing Day. Kirby Smart and UGA football are expected to sign several top 2018 recruits. Georgia’s 2018 class is currently ranked 1st by Rivals and ESPN and 2nd by 247Sports (as of 4:45pm ET). UPDATE: Wilson signed with UGA! UPDATE: Parsons signed with Penn State. UPDATE: Salyer signed with UGA! UPDATE: Mays signed with UGA! UPDATE: Cox signed with UGA! 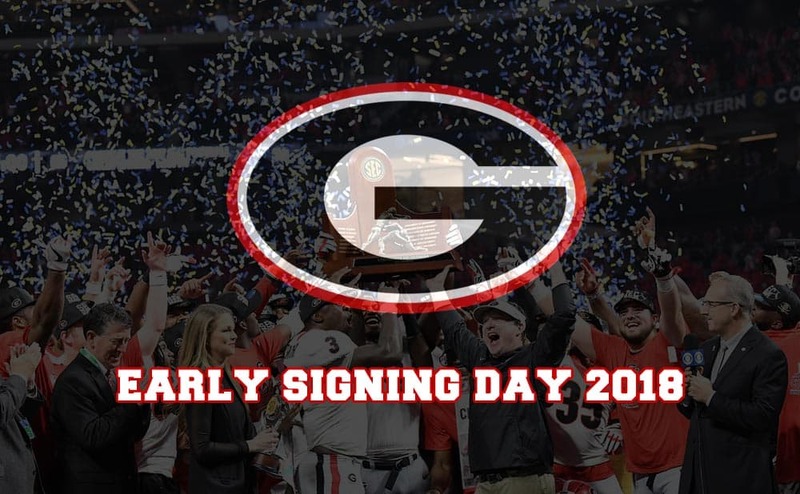 As we do each year, SicEmDawgs.com will post the 2018 UGA Football Signees as they come in. We will also update this post throughout the day (see “Live Signing Day Updates” below). Feel free to join the signing day discussion in the comments section at the bottom. 7:26am – 4-star OL Warren Ericson has signed his LOI with UGA. 7:31am – 3-star K/P Jake Camarda has sent in his signed LOI to the Bulldogs. 7:50am – 4-star WR Elijah Moore of St. Thomas Aquinas has decided to sign with Ole Miss, per the Sun-Sentinel. Rivals reports that Georgia backed off of him. 8:12am – 3-star OL Owen Condon of Oklahoma City, OK has officially signed with UGA. 9:50am – 4-star tight end John FitzPatrick of Atlanta has signed his LOI with UGA. 10:05am – 4-star WR Kearis Jackson of Fort Valley, GA has signed with the Bulldogs. 10:07am – 5-star OL Jamaree Salyer has committed to Georgia! A huge pickup for Kirby Smart and the Dawgs. 10:32am – 4-star CB Divaad Wilson of Miami, FL has committed to Georgia. 10:34am – 4-star OL Trey Hill of Warner Robins, GA has signed his LOI with UGA. 10:43am – 4-star RB James Cook of Miami, FL has signed with Georgia. 10:52am – 5-star OL Jamaree Salyer has officially signed with Georgia. 11:39am – 5-star RB Zamir White from Laurinburg, NC has signed his letter of intent with Georgia. 11:56am – 4-star DB Azeez Ojulari and 4-star DB Chris Smith have both officially signed with UGA. 12:04pm – 4-star CB Divaad Wilson, who committed to UGA earlier today, has officially signed with the Dawgs. 12:26pm – 5-star QB Justin Fields has signed his letter of intent with the Georgia Bulldogs. 12:45pm – 5-star LB Adam Anderson has signed with UGA. 2:49pm – 5-star OT Cade Mays just committed to UGA live on ESPNU! 3:35pm – 5-star DE Brenton Cox of Stockbridge, GA just committed to UGA over Alabama live on ESPNU! 4:04pm – JUCO 4-star DE Devonte Wyatt has officially signed with the Bulldogs. 6:44pm – A big surprise for Georgia! Four-star cornerback Nadab Joseph has flipped from Alabama and has signed with the Bulldogs. 8:40pm – 4-star OLB Channing Tindall has committed to Georgia over South Carolina.